Protecting against soybean cyst nematode (SCN) just got easier with Clariva® Elite Beans seed treatment. 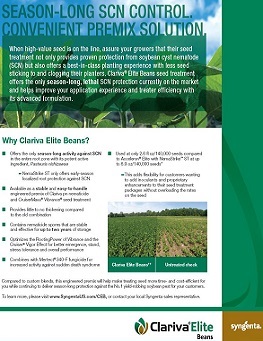 Clariva Elite Beans is an easy-to-handle premix of Clariva pn nematicide and CruiserMaxx® Vibrance® seed treatment and is the next generation seed treatment to Clariva Complete Beans*. Unlike any other seed-applied soybean seed treatment on the market, Clariva Elite Beans provides season-long activity against SCN. Recent Iowa State University research supports the addition of nematicide seed treatments to SCN management plans. More than 95% of SCN-resistant varieties contain the genetic source PI88788. Because SCN has adapted to this resistance, nematologists recommend using an integrated pest management program to better manage SCN. By combining cultural practices, such as non-host crop rotation, with proven seed treatments, you can extend the life of SCN-resistant seed genetics. What Sets Clariva Elite Beans Apart? *This grower used seed treated with Clariva Complete Beans, a combination of the separate products found in the Clariva Elite Beans premix. Clariva Elite Beans will help protect your soybean roots from SCN. Clariva Elite Beans** (right) is powered by the unique RootingPower of Vibrance fungicide and the Cruiser Vigor Effect. These two components help optimize soybean yields when compared to Pioneer Premium Seed Treatment® (second from right) and a generic blend (second from left). SCN can damage the roots, making it easier for other diseases to further infect the seedlings, as seen in the untreated check (left). Source: Syngenta trials, 2017, Kinston, NC. Poor stand and emergence are two above-ground symptoms of an SCN infestation in fields. As seen in the photo, plants treated with Clariva Elite Beans** (left) have more even emergence and plant vigor than the untreated check (right). 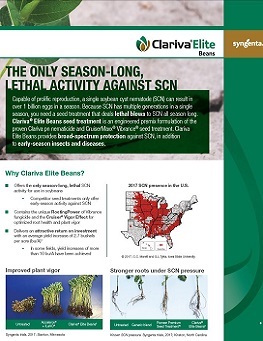 Clariva Elite Beans** is the only seed-applied nematicide premix with lethal, season-long SCN activity. SCN infestations can affect plant stand, as seen in the photo of the untreated check (left). Greater root mass helps provide better stress tolerance throughout the season. Early-season root loss is often never recovered, leading to smaller root mass with lower stress tolerance. In-house trials at Syngenta show the root difference between Clariva Elite Beans** (left) and Acceleron® + ILeVO® seed treatment (right). Source: Syngenta trials, 2017, Stanton, MN. Healthy root systems are crucial for plants to reach full yield potential. Early-season root loss is often never replaced, leaving reduced root mass season long, limiting your yield potential. As seen in the photo, plants treated with Clariva Elite Beans** (left) have more vigorous root systems than the untreated check (right). *A combination of separately registered products. Clariva Complete Beans is an on-seed application of Clariva pn and CruiserMaxx Vibrance. Clariva®, Cruiser®, CruiserMaxx®, Mertect®, Vibrance®, the Alliance Frame, the Purpose Icon and the Syngenta logo are registered trademarks of a Syngenta Group Company. ILeVO® is a registered trademark of Bayer. Acceleron® is a registered trademark of Monsanto Technology LLC. Pioneer Premium Seed Treatment® is a registered trademark of Pioneer.